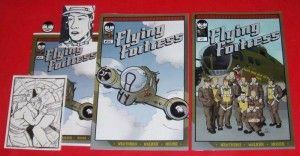 Andy Moore and Eric Weathers, the guys behind Flying Fortress Comics, have returned to graciously provide StashMyComics.com with its latest giveaway! I’ve enjoyed following Flying Fortress since coming across the series last year, and am happy to have gotten to know them a little more since the interview we shared on the blog last October. Andy and Eric are both hard working comic book artists trying to make a living, and they are sharing their hard work for FREE with one lucky member of StashMyComics.com! SERIOUSLY, how cool are they?! This giveaway comes on the cusp of Flying Fortress’ Kickstarter campaign, where they have raised close to $700 to go toward the production of Volume 1 of this series, and costs associated with embarking on a comic book convention tour for 2012 to get the word out about their awesome work. The campaign ends 7 days from the posting of this notification…everyone should really check it out! They have some sweet offers on there depending on what you are able to contribute. For instance, ONE measley dollar will get you a “thank you” credit in Volume 1 and a free digital copy of issue #1! How many opportunities does one get to donate to a cause and get someting out of it? Way cool! If you are interested in entering our giveaway please remember this is only for members of StashMyComics.com! BUT, you can easily join StashMyComics for FREE by simply signing up! Once you do that there are several ways you can earn points including; submitting missing issues from our database, cover images, issue information, writing reviews on comics in your stash, and rating your comics! Easy stuff! Click here to enter the contest! And, last but not least, your choice of having the items Autographed!! My tickets are in! I loved the concept of the story when you inteviewed them last, and it seems they’ve only pushed harder to make it look even better. Good luck guys, and I hope you take this comic as far as you can! I just pledged $5 to the Kickstarter Campaign! My name will live on in the Thank You section of Volume 1! Woo hoo! AND, I get stuff! I’m backing them on Kickstarter now too, and I threw in a plug for SMC in the comments. Awesome!! Thanks Andrew! Are you involved in the forums? What is your user name? I do comment on the forum from time to time as reklov77 (Volker spelled backward. Seemed very clever when I was 14, now stuck with it). Oh haha I guess I never heard your real name!